In June last year I finally bit the bullet and decided to start my own blog. Here we are 10 months later still blogging and loving it! I do get a lot of messages about my blog asking why did I start a blog? How did I do it? or that they wish they could start one but they are too worried about what others may think. 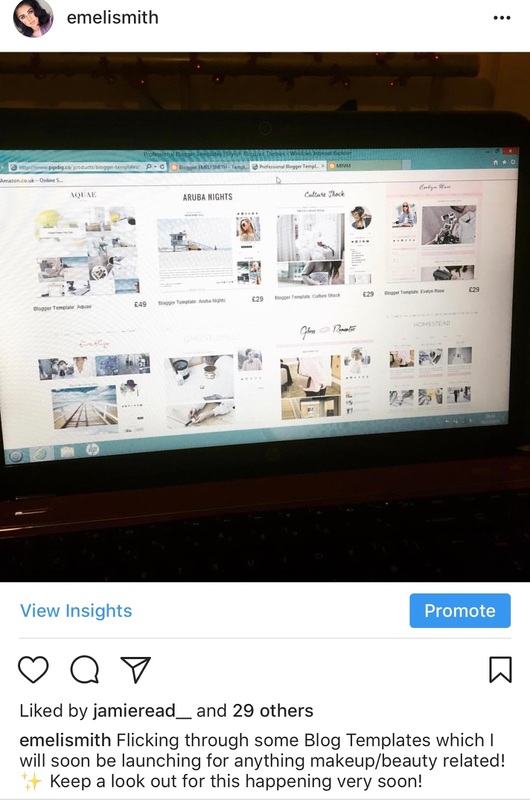 So I thought I'd sit down today and just share my experience and what really motivated me to finally start my own blog. Yes, that was me in 2013 - the peak of my Emo phase. I was 16 at the time and I was in love with Beauty and Fashion Blogs and I feel thats when they really started to kick off and get popular. Of course I always kept up to date with the likes of Zoella, Tanya Burr and the others in that gang who where very well known and are huge now on YouTube but I loved to read their blogs - it's a shame they don't update their blogs that much anymore. So yeah, that was my inspo for me to start a blog in 2013. The image above I actually created this for my own blog that I made it was kind of rubbish and as you can see so was my shabby paint job - my middle name is actually 'Clare' but I stuck an 'I' in it to make it look cooler (because that worked). Basically I tried out blogging and was too afraid to actually share with the world what I was doing and just kind of gave it up. So yes as you can see I was very keen on the idea of recreating my blog that kind of failed in 2013 and was ready to try again! I remember looking at these templates the weekend before I actually started a new job and after that I kind of lost my way a little bit. It wasn't that I didn't want to try again but I think it was more things getting in my way and just never really got round to it. Now lets move on to June 2017 where I decided to launch my brand new beautiful blog and show it to the world, yes it wasn't perfect and it still isn't perfect but I love it and I love to share everything on here. I think sometimes in life you just have to bite the bullet and do all the things you love. For years I'd always stewed about starting a blog should I or shouldn't I? Instead of feeling like this you should think about it this way - If it is something you really want to do, then do it! Screw what other people might think of you or what Sally from round the corner might be telling her friends because you've done something a little different from everyone else, because that's okay if it's something you are passionate about you should always give it a go! If it makes you happy and you enjoy it then stick with it but if you find that maybe this isn't right for you its easy enough to stop that thing your not enjoying. Don't get me wrong launching my blog was possibly one of the most nerve wracking things I've done, I live in a small town where everyone knows each other so I think I cared a little too much about what others might think. I got to the point where I couldn't live my life like that any more, I do the things that I want to do for myself and not for anybody else and thats what rule I live my life by now. After realising this about myself it really gave me that push and I though f*ck it I am going to do this! I guess you kind of have to let go of your worry and not let that control you and take over your life and if anyone along the way says anything bad about you or what your doing then use that as motivation to push yourself as far as you can. Because who want's to be the same as everyone else?! I was recently sent from GamelyGames - Randomise for me to try out with my friends and family and just really have some fun with it. It is a game split up into groups to draw, act or describe your cards to the other team! So today I thought I would share a little review on this game and let you know my thoughts and opinions on it. So the first thing I did when opening up this game was to read the instructions (Duh!) basically you need to split into teams of two or more and create a kind of stage in the room that you are playing in. In the box there are two timing cards & two scoring cards, you need to pick a player to keep score and give each team a timing card. After you set up and your all ready to go, a player of each team goes up to the stage and picks one of each card - A,B & C. Keeping your choices to yourself on the back of your card will be an easy or a hard option, I would definitely advise trying the easy section first and then move on to hard after getting to grips with the game. So for example on this set of cards chosen you could pick 2, 2 & 1 and you would get Blind Monkey Feeding the ducks you then have to use this sentence (no matter how ridiculous it may be) and try to either draw, act or describe yourself as this to your team and hopefully they will get it right! When I played with my family we just kept going for a few rounds and kept score to find out who was the winning team at the end. It is definitely a great game that you could keep playing for hours on end, it is so great and light-hearted and it definitely has the full room in giggles. Growing up I always loved playing charades and my family often breaks out the occasional HeadsUp game at any family event so it was definitely something fun and new to try! I also love that they advertise this game for ages 8-80, 4-40 players and can be played for anything up to 30-60 mins. I definitely agree with this as you can have all ages playing and can be a huge room of people really getting into the game and having fun! There is also so many random combinations in the game so you will never be repeating yourself and each turn is equally as fun and exciting. A huge thank you to GamelyGames for sending me Randomise, it will definitely be used at many of our family events or if my friends come round for a girly night! Go and check out GamelyGames on Facebook & Instagram to keep up to date with them. I hope you enjoyed reading this post, a lot of you may not know but I am a huge nerd when it comes to any game ever! I love trying out new computer games and I have always loved board & card games. So if you enjoyed this type of post please let me know if you would like to see more in the comments below. I can't believe February is over with, I can't even cope with how fast it has gone! February was a really great month for me as I started to post back on my blog regularly and spent a lot of quality time with my friends and family. This month I really wanted to share with you some goals that I want to set myself for this month. I definitely find this a very helpful thing for me and it's just such a great idea so that you can look back at the end of the month and see which goals you hit and any that you didn't manage and maybe work towards them in the next month. I love reading these posts myself so figured now would be a great time to share mine. So, here are my goals for March 2018. What goals are you going to set for yourself this month?